Price Paid: List price minus REI member rebate. 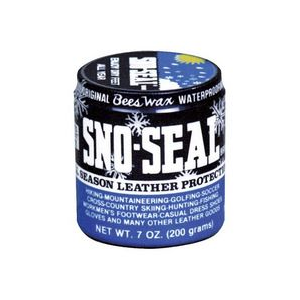 An ESSENTIAL tool for real world use of leather, such as boots used in the outdoors (works well on indoor shoes too). 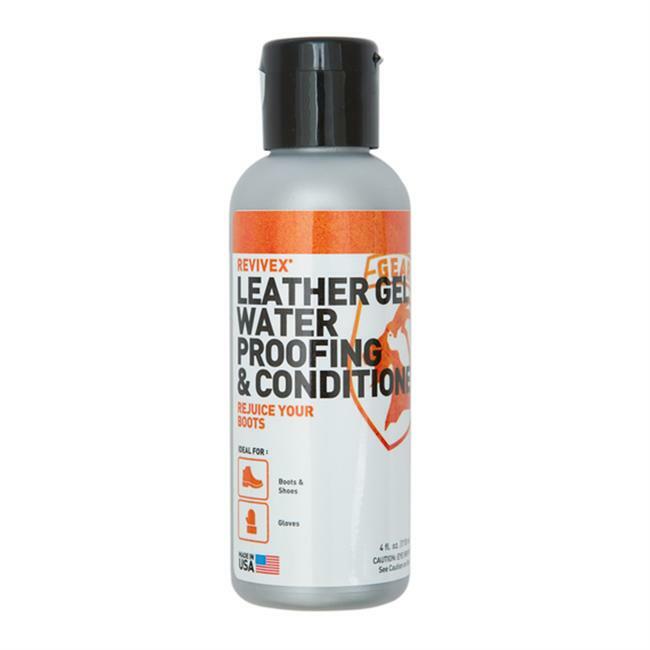 Restores supple feel and flexibility to dry leather gear. Restores water proofing without hurting the gear. Neutral color, but does increase the color present giving a darkening effect to the leather. Works with Gore Tex and eVent waterproof membrane boots. Waterproofs about like Nikwax itself. Also useful if you want to darken leather and give richer colors. Applies as a milky emulsion, but does not go milky again once dries on the leather. Easy to apply, buff finish and just use water to clean up. No fumes or irritation using it. No gloves needed. Neutral color, one bottle treats all my leather products. Also works on surface textured leathers (note changes however). Works well with Gore Tex and eVent membrane protected boots! One container treats MANY pair of boots! Use will change semi-matt finish, microsuede, and suede leather to resemble regular slick leather. Nikwax Conditioner for Leather label for bottle used in this review. 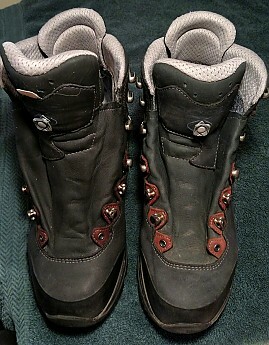 My wife scored a nice Lowa Albula GTX boot deal this fall at an REI Seattle garage sale. 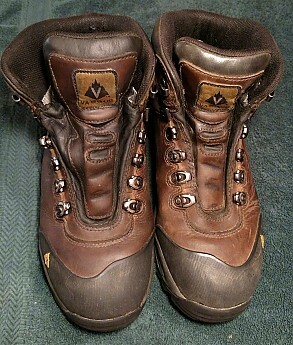 The boots were like new in shape, but looked a little dry from long term storage prior to sale. I gave one conditioner treatment to the boot on the left. Notice the dark blue and raspberry red leather colors deepening. The boot is quite black blue and cordovan maroon now. The micromatt suede surface was lost and looks slicker, more like a traditional leather. We like the new look! However, if you picked a favorite boot for a specific appearance, do not use this product, or it will likely alter the appearance. I find the conditioner an essential product to keep my gear in great shape in the often moist Pacific Northwest climate. We have a lot of wet weather and mud here in the PNW. 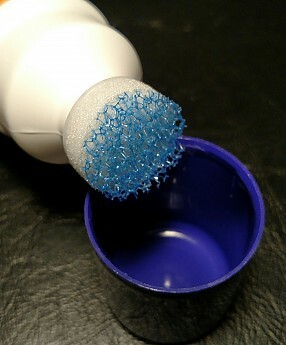 Immediately after we get home from each hike we cold tap water rinse (no soap), lightly brushing our boot surfaces. This likely causes boot leather to require conditioning sooner than in drier climates. Start treatment by rising off the surface or your boots with plain water and wipe dry with a soft cloth. Treat while still wet. There's a sponge top applicator just under the lid. Brush it on. The first time you use the conditioner, let it soak in for a 10-15 minutes and then wipe off the excess in the seam areas and surfaces. You will see it soaking in. You don't want to saturate the leather. Just make sure you have good coverage and penetration. This is easy judged by the darkening effect, which looks like the is leather getting wet and disappearing as it soaks in. I do tend to use the conditioner on the heavy side the first time. But I avoid saturating the leather as to not risk challenging the Gore Tex on the other side of the leather. Wiping the excess off remaining dirt and color on the boots will also be removed. I like to let boots dry over night and lightly reapply once again. We supply enough air movement to make sure that boots dry within a day or two. Our boots REALLY seem to last this way! No microbial odors or molds have developed, nor have rubber rand or sole delamination happened for us using this Nikwax Conditioner in this manner. Once the first coat(s) dry the leather seems to seal against the water based product, self limiting the amount that soaks in. Follow the 2 minute recommendation this time on the label to not overdo it. Typically little soaks in again, unless re-treatment is past due. The goal here is to keep the leather breathable. 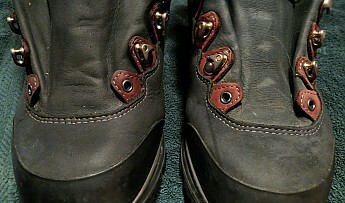 Conditioned boots tend to lighten a bit as the conditioner washes and wears off during hard gear use. You can easily see when and how much to treat boots again. Out here, we never avoid wet hikes, and we recondition after about 20 hikes 300+? miles. I've been conditioning this way for several years and so far this seems to work well, maintaining the functional use of the gear. The lack of treatment permanence is fine by me to not lose Gore Tex function! I like the deep rich colors that you can get with Nikwax conditioned leather, which previously looked dried out. Surface cracks seem to disappear. And the leather becomes more like new, sometimes even better. I never use Kiwi shoe wax to re-color scuffed boots, because I see it attracting fuzzy mold attack on stored leather items (shoe dye might be ok). 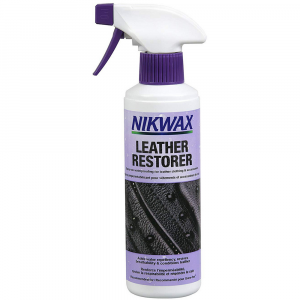 When boots need extra care or a more protective surface, I use Nikwax paste wax itself as a final surface treatment. 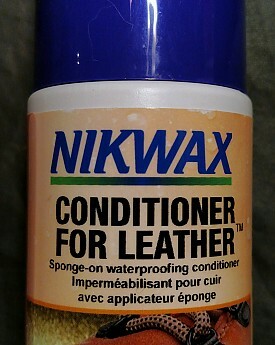 Nikwax Conditioner alone, given as two coats, seems to waterproof about as well as the paste wax, but is less visible. If I want a deep buff polished looking surface or more protection, such as with in Snow Shoeing, then I for sure use the Nikwax paste wax. My wife's Vasquez boots in the photo that follows this trip photo just spent 4 hours yesterday in driving rain, slogging through slush, water puddles, and over wet rocks, roots, and boardwalks near Mt Baker WA at 37 to 42°F on the Anderson and Watson Alpine Lakes Trail. Her boots' surfaces were already starting to look a little weather worn after the last many months of hikes. 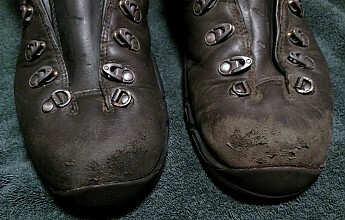 Treatment of Vasquez St. Elias boots before (right) and after (left). Note how the leather treated leather on the left looks like new, supple, and has deepened in color. They are over 3 years old and this is the third treatment for the left boot. Admittedly the right boot looks quite nice before the treatment. My wife has put 1,000+ plus miles on these boots along with me, plus she's had them quite some time before I got my boots. Nikwax Conditioner has been an important part of their care. 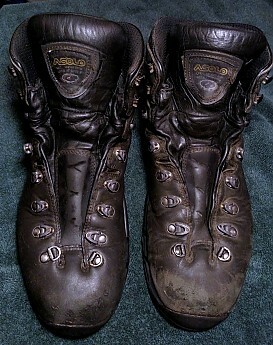 Below are my size 12 Asolo Power Matic 200 boots with 1,000+ miles on them. They have been Nikwax Conditioner treated 3-4 times over the last three years since I've had them. After the last hike I treated only the boot on the left with one conditioner coat to show how the leather was effected visually ... the leather surface feels and looks better! Scuffed toes. Fresh treatment of the left boot with one coat improves it! 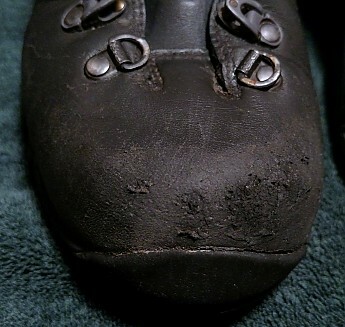 Closeup of boot toe not recently treated (right boot above). 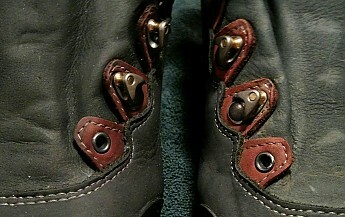 Closeup of boot toe just treated (from left boot above). Nikwax paste over the toe would seal this even more. Although it alters surface appearance, I actually like to also use this conditioner on semi-matt, microsuede, and even suede leather! Having more surface area exposed, it seems to take on more surface wax better protecting the boots. They end up looking more like regular leather, as in the Lowa photos above. 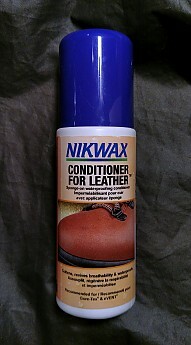 (Guess I need to test Nikwax suede leather conditioner too! Comments anyone please?). The bottle has a snap-on top that seals well and protects the conditioner. The milky emulsion wax in the liquid inside is easily re-suspended by shaking before each use. It has excellent shelf life and doesn't seem to spoil with microbial growth, even though it has organics in water. 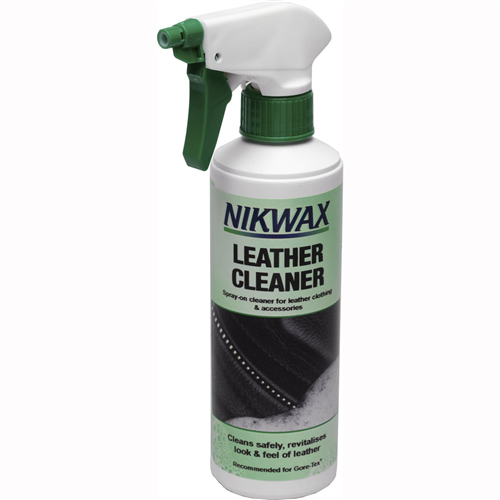 The way to improve Nikwax Conditioner for Leather would be to have it not change either the colors or surface texture of semi-matt or micro-suede leather boots, and to have it last for even more hikes before needing reconditioning. However, treatment impermanence is a fair trade for this level of protection and maintaining original function. Thanks for the Nikwax review, Gary. 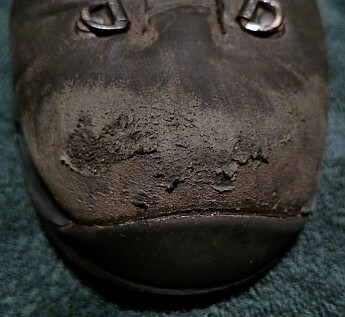 I'd be curious to see pictures of your boots before and after the next time you treat them. Actually. The toes do need treatment after tomorrow's hike to Mt Baker! Stay posted. Posted a couple photos to show effect of treatment. Now I have finish the the other two boots. Thanks a lot, Gary. Looks good! Great job Gary. I am sold it. Thanks for such a thorough review which left me with no questions to ask! Michele, like to hear your results with it? NEVER USE ON SUEDE!!! My friend tried to weather protect my brand new 100$ Uggs and completely ruined them. They are now blotchy and went from a light brown to a dark brown, almost black. Very very very very upset. In short, read the directions and never use this stuff on suede or you'll ruin anything it touches!! My experience was poor, however it was used incorrectly. Just want to let people know if anyone does try to use it on suede.